My thirteen-year old niece. She’s a sucker for the Marvel movies, and since I was going home for Easter, I asked her if she wanted to see the movie. She said yes. My brother. Another geek, mostly. I had initially asked him if he wanted to come along with our niece and myself and bring his oldest son (age 9) too. My brother wanted to see the movie first before he took his son. Understandable. Then he asked me to get another ticket when I bought them. The open seat. Here’s where everything got complicated. The original person I got this for was my sister-in-law, who is not a geek. At all. But, she got sick Saturday. My brother asked his son. The kid wanted to go at first, then changed his mind for some reason no one understood. The last ticket was eventually used by my brother’s father-in-law, of little geek persuasion. So, tickets in hand, this motely group went to see the movie. Review and SPOILERS after the cut. OK, to cut a little bit to the chase, everyone in the group liked the movie to one degree or another. My niece when asked gave the movie a ten out of ten, saying she didn’t care for a single jump scare and liking most the rest. She hadn’t seen Man of Steel, so I filled her in on stuff as the movie went, but she had a good time and said she wouldn’t mind seeing Wonder Woman next year. My brother liked it and will take his son (and probably our father when he gets back from his annual spring vacation). Even his father-in-law liked the movie, despite saying he usually cares for neither Batman nor Ben Affleck. But none of those folks write here, so what are my more extended thoughts? Well, for a movie that was over two and a half hours long, this movie felt short. By that I mean much of what transpired seemed to be a series of short scenes that more or less melded together and didn’t give its characters room to breathe or grow. That’s hard to do with a movie that has so many prominent characters in it, and still needs to find a place to fit in the birth of the Justice League. As it stands, I think we got half of a good Batman movie, and maybe a third of a good Superman movie. The casting largely worked. Ben Affleck, despite fan concerns, was a fine Batman. Jeremy Irons was of course fine. Jesse Eisenberg was a scene-chewing Lex Luthor, but just about everybody who’s played Lex Luthor has done plenty of scene chewing. Amy Adams is, like, my favorite actress working today, and she did OK with little to do aside from show up when needed as Lois Lane. I don’t really think any of them had much to work with, but they did OK.
As for Gal Gadot’s Wonder Woman, what little screen time she got worked out well. Her appearance was spoiled by trailers and such, and some of what was there was clearly set-up for her movie next year. But she expressed a much more, well, optimistic tone for lack of a better word than either of the two characters in the title. 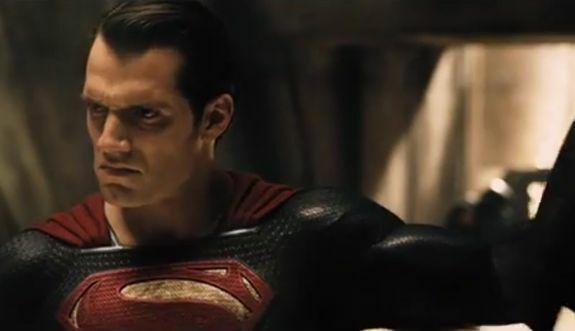 Superman is supposed to be the inspirational hero, but as played by Henry Cavil, he seems more mopey than benevolent. Again, that could be the script/direction. When Gadot is onsceen, she talks about being a better person than others, and that there is the possibility of a better world. That sense is never offered by Superman, either here or in Man of Steel. Superman here just swoops out of the sky like a distant figure and saves people. We never get an idea of why he bothers. He’s the dream of a Kansas farmer he says at one point, but Pa Kent in the previous film seemed to think he shouldn’t be helping people if it gets his secret out. The weird costume and the glasses don’t cover that dream. It would have been plausible if Pa Kent had told him to do good for people for some reason. Instead, even with his dream sequence appearance here, he seemed more inclined to say helping out can just make things worse. Batman, on the other hand, sees the world as chaotic, and mostly wants to stem what little chaos he could. For a great detective, his motivation to take down Superman at the end of the movie didn’t make for a lot of sense. And I didn’t mind a Batman killing criminals here and there since Michael Keaton’s Batman beat him to it. The final battle, between the big three and Doomsday, is probably what the critics hated, but that moviegoers won’t mind. Massive CGI battles with little sense of casualties don’t appeal to critics. Zach Snyder has a certain style, and it works for audiences but not for critics. For myself, I saw a Zach Snyder movie. I knew what I was getting when I bought my ticket. Some nice visuals, decent action, big stakes, but also poor characterization and little time to breathe. Very little knocked me out of the film, aside from Batman deciding Superman as OK since they both had a mother named Martha, and Lex knowing both their secret identities. I didn’t hate the movie, but I wouldn’t say I loved it either. I think anyone looking for something along the lines of a Nolan Batman movie, which at least appears to be saying more than it is, will probably be disappointed. Anyone looking for a decent popcorn flick will probably be satisfied. Everyone in my group was. I’m giving it seven out of ten Aquaman cameos. Prediction: Bruce Wayne’s dreams about parademons and what looked like a Crisis-inspired Flash will probably be seen again in the Justice League movie, with Darkseid being the reason Superman comes back, initially as an enemy. I’m afraid this gets my lowest rating ever. Seven thumbs up. Critics have been unfairly harsh. I think it just became a game of one-upsmenship to see who could bash it the most. It does not deserve the bile that has been spewed towards it by critics. And given the massive opening weekend at the box office, no one is listening anyway. will be more evident in the coming weeks. But enough about critics and Cinemascores, the real reason you are reading this is to find out what I thought! Well…I said above that it wasn’t bad, but you know what it isn’t? Great. It is good. It is worth watching. It is definitely worth checking out if you are a fan of Batman and less so Superman. I think it is better than Man Of Steel, which itself has a Rotten Tomatoes score of 56%. I came out of the film and I thought, “it wasn’t bad, but it wasn’t great…it may be the most mediocre movie I have ever watched.” I would struggle with giving the film a thumbs up or down. It is more of a sideways/indifferent thumb as it deserves neither of the previous. Tom gives it a rating of 7/10 and I think that is fair. Maybe even a shade high, but 6.5 is too low. If I could go 6.75 I would. 1) The script. This may be the worst scripted of any of the modern age super hero movies. In-between spewing horrific lines like “The red capes are coming” or “Do you bleed?”, and people doing things for absolutely unknown reasons besides plot, the story is so paint by numbers that you can guess everything little thing that is going to happen. Especially if you are at all familar with the DC comic book universe. 2) Luthor. I like Jesse Eisenberg. He is a good actor and has been in several movies that I like. So it is not so much his performance, but the character that was written for him and that director Zack Snyder allowed him to be. Was he supposed to be hip and modern? He just came off as completely crazy an annoying. You know who’s not completely crazy? Lex Luthor. He is many things, and ok, maybe a little nuts, but maniacally crazy is not one of them. He may hate Superman with a passion of a thousands suns, but he is still a genius and would prefer to play the long con as opposed to prancing about eating Jolly Ranchers. Those two things combined offer up plenty of eye-rolling or cringe-worthy moments throughout. And I think one of the other problems with the film is that there are no moments where you think to yourself “this is AWESOME!” to balance it out. The only thing that comes close is the Wonder Woman reveal, which if you’ve seen a TV ad or trailer the last six months, you’ve probably already seen. I don’t know if I can say that Gal Gadot’s Wonder Woman steals the show, because she simply isn’t in it enough to justify that, but when she is on screen as WW or Diana Prince, they are amongst the most interesting segments of the film. I thought Batfleck was good and better than Cavill’s Superman, who I just don’t really like. I’m not sure why. I do find he makes a great Clark Kent though. As for the rest of the Justice League, well, I’ll keep it spoiler free, but I found that everything that was attempting to set up the DC Extended Universe felt incredibly forced or confusing. I get that they don’t want to look like they are copying the Marvel films, but the path to the Avengers felt very organic. Not so here. these DC films are being made by people who really don’t get what makes these characters great. Yup, that is Superman and Batman up there on the big screen together. And that is a very cool, very big deal, but so often they don’t act like “my” Superman and Batman. This may be personal preference or a generation thing, but the Marvel films, while they’ve had varying degrees of success, have always seemed to stay true to their roots and the ultimate vision of Marvel. It seems like the DC films spend more time defending why it is ok to be different from the representations of these characters in other media or past films. and everything in the DCEU can continue on its way status quo.